Emoticons, small digital images or icons used to express an idea or emotion, are nothing new. With the advent of Smartphones, they joined the mainstream, and were seen in text messages and Instagram hashtags. 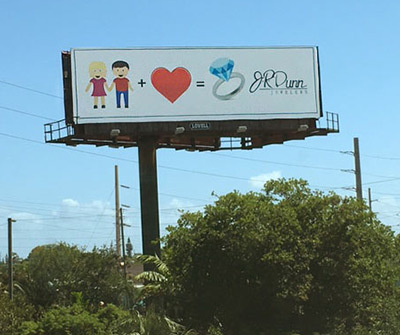 Now, emojis have a starring role in a business billboard from J.R. Dunn Jewelers, at I-95 and Oakland Park Boulevard, heading north. Drivers can see the graphic message: couple plus heart equals diamond, along with the J.R. Dunn Jewelers logo. The translation is: A couple in love will get engaged with a diamond ring…with J.R. Dunn as their destination. The billboard was designed by J.R. Dunn Jewelers Graphic Designer Lauren Paletz. J.R. Dunn Jewelers carries a large selection of engagement rings, both online and in its South Florida showroom located at 4210 N. Federal Highway in Lighthouse Point. An authorized retailer for some of the biggest names in the industry – Tacori, Verragio, and Simon G., to name a few. Unique, one-of-a-kind custom creations are also a specialty, with an award-winning designer in-house: Robert Pelliccia. An extensive diamond vault is also on the showroom premises, featuring gemstones of all shapes and sizes, certified by the Gemological Institute of America (GIA). The family-owned-and-operated J.R. Dunn Jewelers was established in 1969. Two generations work side by side to bring the best in selection and customer service to South Florida. The 8,000-square-foot showroom serves clients in Miami, Ft. Lauderdale, Deerfield Beach, Boca Raton, Delray Beach, Boynton Beach and West Palm Beach, while a thriving eCommerce business assists clients locally, nationally and internationally.